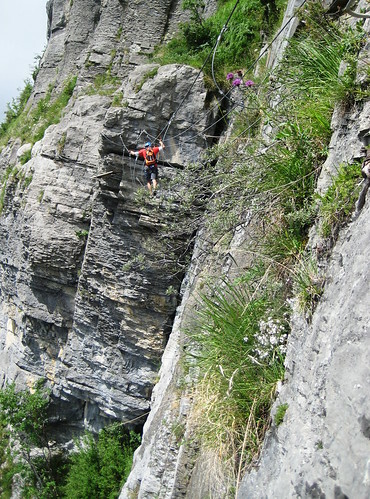 An activity holiday to Chamonix in June saw me try self-guided via ferrata for the first time. The recently built Via Ferrata Curalla at Passy, about 30 mins drive from Chamonix towards Geneva, is graded AD+ (Assez Difficile; technically easy but exposed enough to be a bit scary). Well sign-posted from the car park on Chemin de Curalla in Passy (map) the climb covers about 400m with nearly 200m height gain and takes 2-3 hours including the walk back from the top. We found hiring via ferrata equipment (standard climbing harness, shock-absorbing Y-shaped sling with twist-gate carabiners AKA "via ferrata set", helmet) in Chamonix to be a little tricky. The slings are designed to be highly dynamic so that they absorb the shock of a long fall, and as a result can deteriorate in condition internally after a fall without any visible change. All the shops we tried wouldn't rent out equipement for this reason. However, I'd been in touch with www.chamonix-sport-aventure.com who seemed a little less formal and was able to rent via ferrata equipment for our group. The alternative of buying our own kit wasn't particularly expensive -- the sling/carabiners contraptions start at EUR40 at shops in Chamonix. Our group of 5 novice via ferratarers (is that a word?) really enjoyed Via Ferrata Curalla. It was psychologically challenging enough with wire bridge and narrow planks in places, but fundamentally pretty easy with large metal pegs, loops, and steps in all the appropriate places. If only there were more via ferrata routes in the UK! (I'm aware of only one; at Honister in the Lake District).